The first time I saw this ashtray was at the Legends of Fire cigar lounge here in town. When I saw it, I knew that some day I would have one. I was impressed with the size, the style and the overall design, (designed by musician and men's custom jewelry designer, Matt Booth). This thing is a beast! It's 10 inches square, 2 inches tall and the stirrups will hold a massive 70 ring cigar. It has a nice satin finish, crisp clean graphics and great overall eye appeal. It's large enough to hold four cigars and their ashes without being emptied. This will make a great summer patio piece when friends are over. If you use it indoors, the felt pads will protect what ever surface it is setting on. The only down side to this product is that it's ceramic and it will break if dropped on a hard surface. I give this product a 5 out of 5 rating! As you know by now I was unable to attend IPCPR this year so Jay from AKA Cigars sent me a few pre release samples of the new, re blended 2013 Respect. Here is what AKA Cigars has to say about the new 2013 Respect on their website: "The new blend has been toned down from the original and offers a ton of flavor of earth notes, cedar, and woodiness along with a silky leathery finish. The awesome burn and effortless draw will produce a nice heavy volume of smoke that will have your senses and palette craving more." I loved the original version of the Respect, and have smoked many since the first review, let's see how this one stacks up! Construction: The first thing that stands out when looking at this cigar is the silver on black triple band. These bands against the dark wrapper create a nice contrast and really makes this stick stand out. Examining the wrapper I see that it contains only very fine veins and has the aroma of toast. Moving to the foot I found the same toast aroma mixed with sweet mocha. Feeling the cigar from head to foot I found it to be well packed and contained no hard or soft spots. Nice! I punched the end and tested the cold draw next. The draw was firm, but not to tight and the cold flavor mix was a very nice mix of mocha and oak while the wrapper left a sweet after taste on my lips. I am very excited to put a match to this cigar! Smoking experience: The end was punched and with a match in hand I was ready to go. The first flavor notes to hit me while I was lighting up were tasty mix of chocolate with a hint of cedar. Within a few puffs a hint of toast joined in and lasted to near the cigar's mid point. Into the second third the flavor note of toasted transformed into more of a burnt toast flavor while the chocolate remained and the cedar faded. Nearing the final third the cedar and toast notes were gradually replaced by oak, which continued to build into the nub. I found the shifting flavor mix quite tasty. In the first third the burn was a bit uneven but it self-corrected by the time it had reached the mid point. The wrapper left the same chocolate after taste on my lips that I experienced while testing the cold draw and lasted the entire length of the cigar. Even though the flakey light gray ash look soft, it held tight for several minutes after removing the center band and the cigar created an nice volume of smoke. Final thoughts: First, I thought this was another fantastic cigar from AKA. The flavor profile of the 2013 was tasty and the construction as always was top notch. Second, and the most interesting thing I found was just how different the flavor profile of this new blend was from the original. I gave this stick the same rating as the original blend, even though it was different it is still one of my favorite cigars! Thank you AKA! I love picking up new items from my favorite cigar makers. Finally the wait was over, this beauty from Cuban Stock Cigar arrived at my door yesterday. 8.5" x 8.5" x 2.75"
This ashtray is fantastic! The finish is smooth, the graphics are sharp and crisp and it is the perfect size for the table on the deck. Now when friends are over we can all share an ashtray that is made to hold a cigar! The rests are large and deep enough to hold a 60 ring stick and it will hold the ashes of several cigars before needing to be dumped. The only down side to this piece is that it is ceramic and will break if dropped. 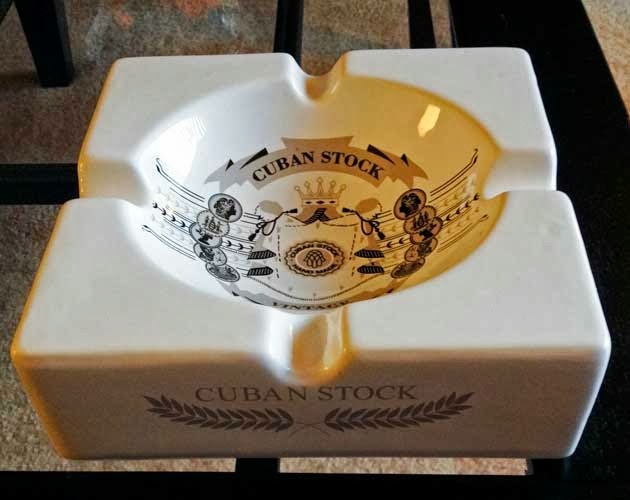 With that being said this is a very attractive, high quality ashtray is sure to give me several great years of service and is well worth the $35.00 price tag! The Cuban Stock Cigars Triumph is an interesting cigar. It is rolled with tobaccos aged for 10 years in oak barrels. I have previously reviewed the Triumph with the natural wrapper and rated it a 94. I am excited and can't wait to give this one a try. Wrapper: Dominican Maduro Special (DMS). As with all other Cuban Stock Cigars, construction of the maduro Triumph was spot on. It has a nice dark and toothy wrapper that only contains a couple of fine veins. The cold aroma radiating from the foot was a blend of tobacco and Oak. Once the end was clipped, the cold draw was even, smooth and tasted of Oak, tobacco with just a hint of black pepper. Once the cigar was toasted and burning the flavor notes from the first few puffs were a full bodied mix of Oak, earth and pepper. With each additional puff the pepper faded and by the time I was 1/4" into the stick the pepper was gone and all I could then taste was a mx of Oak and earth. The cigar produced a nice amount of burnt Oak scented smoke, the burn line was sharp and it left behind a tight light grey ash that held on until the half way point. About an inch into the cigar a nice mocha sweetness started to develop pushing away the notes of Oak and mixing with the earthiness creating a very tasty flavor mix. These flavor notes continued until about the final third where charcoal replaced the earth leaving me with a nice burnt mocha flavored cigar. I love that flavor mix! If you like a maduro wrapper and a full flavor cigar, this is a good one. The construction was spot on, the burn was crisp and the flavor mix was solid, other than the pepper in the first moments. Every thing I have smoked that Cuban Stock Cigars produces I have found to be top notch! Tobacco Mixture: Modern Mac Baren Cavendish, loose cut bright Virginia and fruit oils. The exact mixture is a Mac Baren secret. I've been an off and on again pipe smoker for the last 35 years, but this is my first review so please don't be to critical. There are two things I have always looked for when choosing a new tobacco, lots of flavor, high room notes, and no bite. There is not much difference in my tastes between cigars and pipe tobacco, I don't like my tongue being burned, either with pepper or bite. I spent quite a bit of time reading about different tobaccos and blends when I happened upon the Mac Baren web site. After reading about their different products I was about ready to order a gold cube. Before I had the chance to place that order I stopped in to a local shop that I had not been to before and found Black Ambrosia in bulk. I picked up a couple ounces and headed home with an excited grin on my face anxious to give my new treasure a try. Smoking Experience: Once home I was in a hurry to try out a bowl of this new tobacco so I grabbed my 30 year old Jobi pipe, packed the bowl and lit it up. When I first opened the bag I was hit by a rush of vanilla. The aroma radiating from the bag was fantastic. The tobacco was moist, but not to moist and it packed easily into the bowl. I used a match and it took to the flame quite well and the first few draws were cool and flavorful. I was able to easily keep this bowl burning with one tap and a tamp. Toward the half way point it did pick up some heat and some bite, but it was tolerable. Overall I found this to be a nice tobacco that I will continue to smoke, but it is by no means another perfect blend for me. Right after IPCPR, Jay Lundy from AKA Cigars sent me some pre-release samples of their newest cigar the "Nth Degree". This is there first cigar that comes with a maduro wrapper and I am super excited to give it a try. To put it frankly, to date I love every cigar in AKA's lineup. They all have top notch construction, flavor and burn. I bet they don't let me down. Construction: This is one great looking stick. The light blue and silver double band contrasts nicely against the toothy, broadleaf maduro wrapper and should make it a standout on cigar store shelves. Once again AKA has hit the construction dead-on. The cigar is packed what seems to be just right, I found no hard or soft spots and the wrapper contains only the smallest of veins. The cold aroma from the wrapper reminds me of a chocolate mocha and I found the same flavor notes from the foot. Once the end was cut with my trusty V cutter I found the cold draw perfect and it had the same nice chocolate mocha flavor, plus the wrapper had a nice sweetness to it. OK, here we go! Smoking experience: Once I had the cigar toasted and lit, I was surprised that the same flavors found in the cold draw were present in the first few puffs, then quickly an underlying earthiness developed followed by Oak then a hint of black pepper then right back to the chocolate mocha. Wow, all of this in the first 1/4 inch! About an inch into the cigar the earthiness and oak began to come back but this time with just a hint of leather The burn produced a nice volume of oak and tobacco scented smoke. The burn line so far was just a bit jagged but no where close to needing correction and it left behind a flakey light gray ash that held on until I removed the lower band. By the mid point of the cigar the mocha was coming back into play creating an earthy, mocha flavor mix which I was really enjoying. The flavor mix remained constant until the final third where a bit of charcoal developed. Now, if you have read any other of my reviews you will know that I call this burnt mocha and it's my favorite flavor mix in a cigar. As the burn crept toward the nub a bit of earth came back again then back then once again the flavor shifted to straight burnt mocha, finishing out the flavor profile. Final Thoughts: To sum things up, this is one of the most complex cigars I have ever put a match too and AKA Cigars has put out another winner! Everything AKA produces is top notch in construction, flavor and smoke-ability. The Nth degree is no exception to this rule and it's a great addition to their product line. If you are not smoking AKA cigars, you are missing out! I've been looking quite some time for a decent pipe ashtray when I stumbled across this one. Since I enjoy, and will be soon reviewing a few blends of Mac Baren pipe tobacco I thought this was a perfect choice. Once I had this beauty out of the box I was pleased with the size (7" diameter and a touch over 2" in height), and the finish of this ceramic ashtray. The finish was smooth and glossy over the entire surface and did appear large enough to hold three resting pipes at the same time. After a few days of use it was quick and easy to clean, all it took was a wipe with a damp cloth. The cork knocker is well attached and so far shows no signs of wiggle or looseness and it is large enough to hold three resting pipes at once. The only negative aspect to the ashtray is the ashtray itself is a bit small and if you are not careful the contents of your pipe can land outside its' boundaries, but that has not really been an issue. If you are looking for a product of this type, this would be a good bet. It has a great price point, very nice appearance and is quite functional. I give this ashtray a 9 out of 10. I have been smoking Cuban Stock's for a couple of years now and have yet to run across on I didn't like and the Chubbys didn't disappoint me. To sum it up, the Cuban Stock Cigars Chubbys 3.4.5 pack a big punch for a short, stout stick! Construction: Opening the bright red box was a rewarding experience; inside were 20 neatly packed cigars with a red and gold band around the neck and foot. Examining the first cigar I found it to be firm, well packed and the wrapper was nearly free from veins. The cold aroma from the foot was a mild mix of hay and tobacco. Once the cap was clipped, I found the draw to be free with notes of sweet berries. Smoking Experience: Once the foot was toasted, the flame jumped from my lighter to the cigar and we were off. Again the draw was free and easy and the first puffs had a nice light oak flavoring. The cigar also produced a good amount of smoke with a tobacco, oak mix for the aroma. After the first quarter inch, the flavor shifted to more of an earthy mix, but there was still a hint of sweet berries. Near the mid point the earth and oak had traded places in the flavor mix and the berry sweetness increased a bit more. For the final third the flavor profile stayed about the same but the body continued to get stronger. In the first third I would call this cigar medium-full bodied but in the final third it's a full bodied cigar. The ash held until the final third. 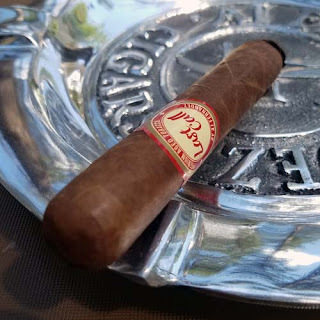 Final Thoughts: For those of you that follow my reviews, you know that 60 ring cigars and I don't always get along well together, but once again I had no issues with this cigar, or any other Cuban Stock Cigars, 60 ring tunneling. That shows me just how well these cigars are made. The Chubbys is another high quality cigar from Cuban Stock Cigars. 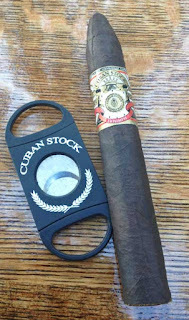 I really enjoyed this short, stout little bomb-shell and it would make a great addition to any humidor!